Lewis Levin is an architect and sculptor working in Johannesburg and Cape Town. 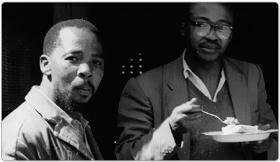 His building projects include domestic and sacred architecture as well as urban renewal work in the Johannesburg inner city. He has recently been involved with the design of the Science Museum exhibit. Speaking of his creation of the monument commemorating Duma Nokwe, he said: "It's especially exciting to be able to use art as a vehicle for recovering memory - that's the way it should be." Levin also specialises in steel work and explores the integration of building facades and sculpture. This signature approach can be seen in his specialised steel fabrications, which have both sculptural and architectural elements. His steel façades filter light, mimicking the dappled light of nature, and translate the external environment from outside to inside. Examples of these are the interlinking screens of the Metro Mall taxi rank complex, and the west façade of the Constitutional Court - both flagship buildings in Johannesburg.